I did a major overhaul of my RIPE 65 SDN presentation prior to MENOG 12 meeting, including a more comprehensive overview of SDN-related technologies sorted by the networking device plane they operate on. NETCONF, OF-Config (a YANG data model used to configure OpenFlow devices through NETCONF) and XMPP (chat protocol creatively used by Arista EOS) operate at the management plane – they can change network device configuration or monitor its state. IRS and PCEP (a protocol used to create MPLS-TE tunnels from a central controller) operate on the control plane (parallel to traditional routing protocols), as do numerous BGP-based tools, from well-known Remote Triggered Black Holes to Flowspec (PBR through BGP used by creative network operators like CloudFlare) and BGP-LS (export of link state topology and MPLS-TE data through BGP). 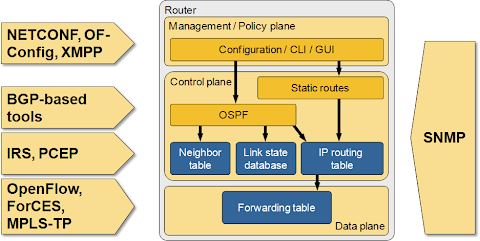 OpenFlow, MPLS-TP and ForCES work on the data plane – they can modify the forwarding behavior of a controlled device or intercept/inject packets. Have I missed a relevant protocol/technology? Please write a comment! Good read Ivan, I have been wondering whether OF-Config get lumped into OF-Switch at some point. Fact that no one really talks about it makes me think vendors have a reason for ignoring it. OVSDB is a slick management plane proto worthy of the list. Really liked that IXP slide deck. I think thats a solid use case. Listened to Feamster talk about one in ATL that they are looking for participants in an IETF86 recording. I had never even heard of that CloudFlare setup, that pretty neat/brave, bravo. Just checked YouTube and still no sign of your presentation video, bah. Looks interesting... will the video be published ? This is the reply I got when asking about the availability of conference videos: "Sorry but this this time we provided streaming only without recording, next we will add recording feature into streaming enshalah." Thank you for trying anyway ! Your blog was pointed to me by a friend. First - thanks for at least mentioning ForCES. If you were to talk to the ONF folks - we dont exist. You did miss some things about ForCES. You could now add eAPI from Arista which is a JSON-RPC representation of the CLI as another method that doesn't require you to have a PhD in understanding the schema used by something.